The last couple years, Hot Wheels has been releasing Scavenger Hunt Special Editions as #Kroger Exclusives. Not to be confused with #Treasure Hunts, these Scavenger Hunt vehicles are usually tied into a promotion at Kroger stores and its subsidiaries. Packaged in the normal mainline cases, these cars are not tied into any series in the mainline for that year, rather, they are similar to the open vamp (not part of any series) releases from years past. Last year, the yellow Bone Shaker and red ’06 Dodge Viper Coupe showed up as part of the Mission Madness promotional campaign. Later in the year, they were found as part of the #Mystery Models pillow packs — plastic bags also referred to as “foil packs”. This trend has undoubtedly continued into 2016 as it has now been reported that the four Scavenger Hunt Special Editions from the “Make it Epic” campaign (from earlier this year), have been spotted in the latest assortment of Mystery Models pillow packs. That includes the #Maelstrom we are featuring today. This isn’t a car thats new to the site as we have learned of its origin in the article we did on the 2002 Hot Wheels Originals version. As an imaginative, #Unlicensed Hot Wheels casting by Hot Wheels designer Fraser Campbell, the car actually has a small following and with simplistic designs like this, you can see why. The bright green paint with chrome accents look great coupled with the outlined “68” on the sides. Since the carded version was only available as part of the “J” cases at Kroger, expect the carded version to sell for a little bit higher than the pillow pack version. Loose, they should both be the same. We will get our hands on one of the Mystery Models releases and update this to let you know. RELEASE DETAILS: Lime Green Body (metal). Clear Windshield. Chrome Interior. White-Rim, Black PR5 Wheels. Pearl White Base (plastic). Made in Thailand. Toy# DLH90. 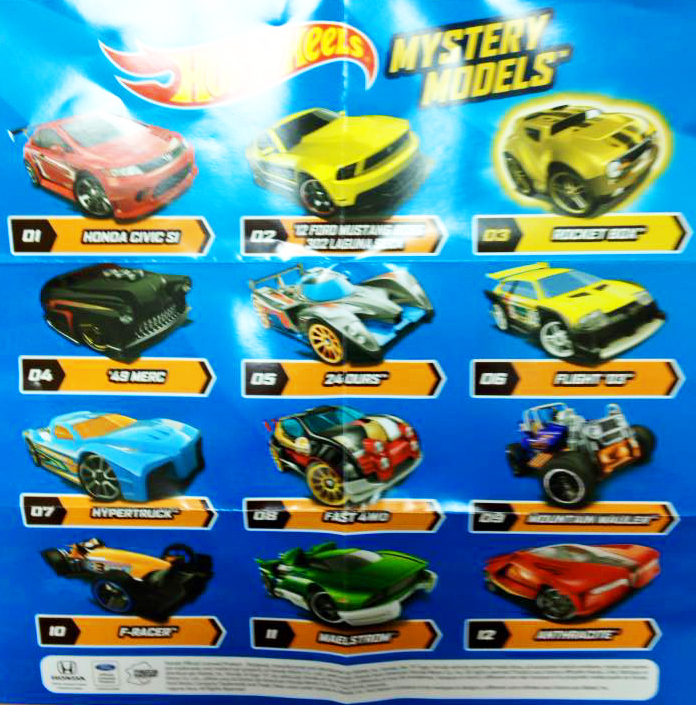 Released in 2016 as part of the Scavenger Hunt Special Editions sold exclusively at Kroger Stores (also available as part of the 2016 Mystery Models).